Cafés and restaurants are definitely not the easiest ones when it comes to lighting design. There are many different functionalities in one space: the mood should stay loyal to the theme of the place; there should be enough light for cleaning and using the cash register; kitchen needs a lighting that supports cooking and activities requiring high definition without generating excessive heat; customers should not be blinded with a lighting too bright but they still should be able to see what they eat – just to name a few. Therefore, a professional lighting designer with the right tools comes in handy when designing a lighting entity for a café or restaurant. Especially when visiting fine dining restaurants, the presentation of the food makes all the difference. It goes without saying, that in order for the chefs to create their masterpieces they should be able to see the colors, shapes and special qualities of the ingredients they are working with. When designing lighting for restaurant and café kitchens, it is advisable to choose LED lighting fixtures with a high color rendering index, high IP-class, right color temperature and fixtures that have enough power. LEDs provide a great solution for this, since they do not generate extra heat and they reiterate colors realistically. For example, Eden LED panel has been a popular solution for kitchens, since it has a size and installation option for every space, has a wide illumination angle preventing unnecessary shadows, is definitely powerful enough and endures the heat and moisture in the kitchen well. General lighting plays an important role in spaces such as cafés and restaurants: it should be powerful enough to support effective cleaning but also go hand in hand with the theme of the restaurant. This is where different dimming systems come in handy: ranging from push-dim to DALI-systems, it is to say that LEDs provide a perfect tool for creating just the right ambience for every situation. General lighting should be constant and shadowless. For example, our Kanna and Lilja LED-downlights have been a popular solution for general lighting, since they have wide illumination angles, are easy to install and to dim. Fixtures with a light beam more narrow, such as Antlia, Libra, Spectri and Iiris, are often used for setting the mood and to complete the lighting entity. Also they are often used to emphasize e.g. elaborate wall surfaces or paintings on a wall. As can be seen from the video above, one can also add up the illuminance levels above the tables by using design LED fixtures as beautiful elements that not only look good but also perfect the presentation of the food. On the video this is done by using our novelties Pearl Line and Pearl Single. The illuminance levels above the cashier should be at least 500lux. Since this level is quite high, it is not recommended to the whole space – usually this is secured by adding couple of fixtures with wider illuminance angels and more power only above the cashiers. For example, Eden LED panels, especially the 30x120 option, have been a liked solution for this. When professionals design the lighting, they use accurate calculations and photometric web files to ensure that the lighting is powerful enough, there are no unnecessary shadows and that the illuminance levels e.g. above the counter tops meet the standards. 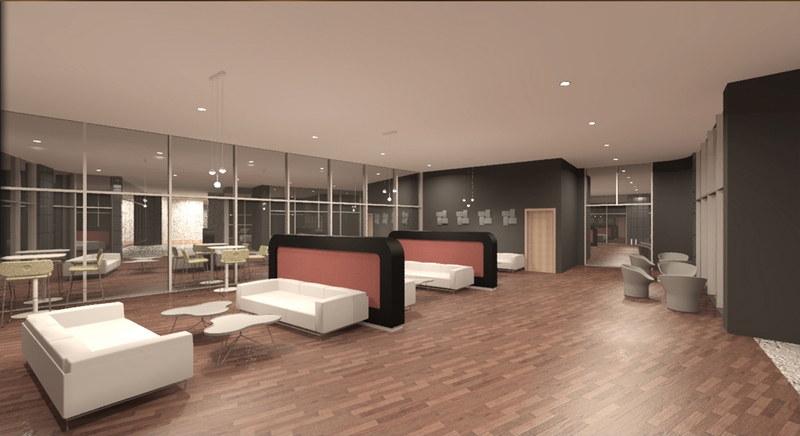 Our designers also use Revit or Dialux to 3D-model the space: this is to realistically present the customers the outcome of the lighting and to double-check that the lighting stays constant and matches with the theme. If You are a designer using Revit You can do this yourself as well! Our new add-on for Revit called LIGHTS is now available for download, and it is inclusive of all our LED-luminaires as Revit families. The families come with realistic features, accurate technical data and photometric web files, so when using them in Your designs, You can be sure what You are going to get when the project is ready. You can also check out our YouTube-channel for great tutorials. You can also contact us if You have any questions or need assistance in finding the perfect lighting solution for Your space – no matter what the size or usage is.